Introduction (E.C. Donaldson, T.F. Yen, G.V. Chilingarian). 2. Origin, Composition and Properties of Petroleum (C. Barker). 3. Fundamentals of Enhanced Recovery (N.R. Morrow, J.P. Heller). 4. Relative Permeabilities (D.N. Saraf, F.G. McCaffry). 5. Flow Tests' Analyses: Liquid Case (A.S. Odeh). 6. Enhanced Oil Recovery Injection Waters (A.G. Collins, C.C. Wright). 7. Some Chemical and Physical Problems in Enhanced Oil Recovery Operations (M.M. Sharma et al.). 8. Waterflooding (G.L. Langnes et al.). References Index. Subject Index. 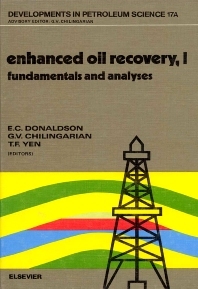 An in-depth study of the fundamental aspects of enhanced oil recovery (EOR), this book brings together detailed analyses of proven techniques. It begins with the current theories of the origin of oil and ends with a treatise on waterflooding which is the basis of the majority of EOR processes. Two and three-phase relative permeability relationships are discussed since they form the basis for fluid flow processes in porous media. The advent of EOR has increased the need for a better understanding of three-phase flow because this has become an integral part of carbon dioxide and steam injection, yet is an area of experimental study that has been seriously neglected. The book gives a complete review and theoretical analysis of two- and three-phase fluid flow, plus a basic introduction to single-well pressure transient testing which is essential to the evaluation of volume, intrinsic reservoir pressure, reservoir discontinuities, in situ permeability and many other data required for complete reservoir evaluation. A discussion of oilfield waters is followed closely by the chemical and physical properties of employing various current EOR techniques. The book will interest a wide range of readers. Teachers of petroleum engineering will find it a ready reference to basic requirements for implementation of various EOR processes. Petroleum engineering researchers can use it to review the current state-of-the-art of the basic premise of EOR and find in it the necessary background analyses for projection of future research. The field-oriented, practical petroleum engineer will discover it to be a reliable reference to criteria for pre-EOR reservoir analysis.